James Shields from Co.Tyrone was an extraordinary Irishman. He had an uncle of the same name who emigrated from Ireland and became a U.S. senator for Ohio. Not to be outdone James Shields Jr. left Ireland at the age of twenty and went on to represent not one but three states in the U.S. Senate. A unique achievement unlikely ever to be repeated. He started in Illinois, in 1849 and served one term. His election was helped by what came to be known as the ‘lucky Mexican bullet’ he had stopped while a brigadier general in the Mexican-American war in 1846. His opponent was the incumbent Sydney Breese, a fellow Democrat. A political rival wrote of Shields’s injury “What a wonderful shot that was! 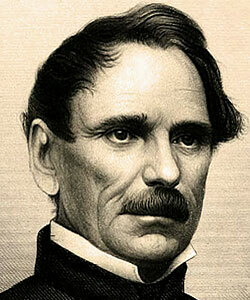 The bullet went clean through Shields without hurting him, or even leaving a scar, and killed Breese a thousand miles away.” Failing to be re-elected six years later he moved to the Minnestoa territory from where he was returned as one of the new state’s first two senators in 1858. Later, during the Civil War he distinguished himself as a Union General and then settled in Missouri. In 1842 Shields was already well known in his adopted home of Illinois. He was a lawyer and was serving in the state legislature as a Democrat. After a periodic economic recession hit the nation in the 1840s Shields, as state auditor, issued instructions that paper money should no longer be taken as payment for state taxes. Only gold or silver would be acceptable. A prominent member of the Whig party, one Abraham Lincoln, took exception to the move and wrote an anonymous satirical letter to a local Springfield, Illinois newspaper in which he called Shields a fool, a liar and a dunce. This was then followed up by his wife-to-be Mary Todd, with an equally scathing letter of her own. When Shields contacted the editor of the newspaper to find out who had written the second letter Lincoln himself took full responsibility. A belligerent Shields, accordingly, challenged the future US president to a duel. The venue was to be the infamous Bloody Island in the middle of the Mississippi river, dueling being illegal in Illinois. The man who might have abruptly ended the life and career of Abraham Lincoln, and radically changed the course of American history, James Shields from Co.Tyrone, was born 207 years ago, on this day.